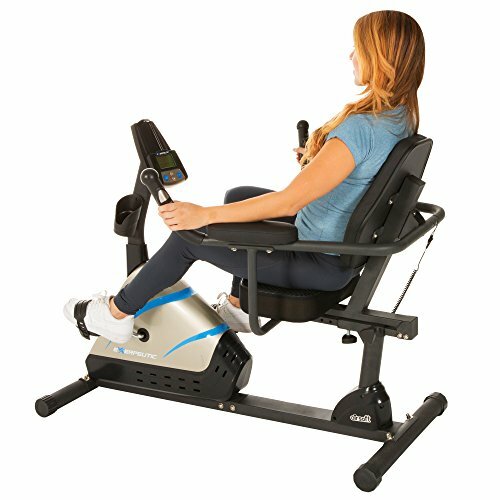 The EXERPEUTIC 2000 Recumbent Bike can handle up to a 300 lb. user weight capacity. The "Air Soft" seat will make your workout feel comfortable, minimizing saddle soreness. It also has a wider seat for comfort, magnetic resistance for challenging workouts and hand pulse sensor pads for targeting heart rate zones, all at a very affordable price. The "Air Soft" seat will make your workout feel timeless, with extraordinary comfort and relaxation. "Step Thru" design providing very easy on and off capability, resulting in a more a more effective and comfortable workout "Air Soft "seat is 3 1/2" thick and is constructed of individual air chambers that are shock absorbing and disperse the user's weight. "Air Soft" seat includes a high technology honeycomb mesh around the sides and a soft PVC weave cushion top which increases air flow and provides maximum comfort. "Air Soft" seat remains cool even after many hours of use. Extended leg stabilizers to prevent any movement or tipping when exercising. Included transportation wheels for easy relocation of the bike. An 8 level Magnetic Tension control system, allows the user to adjust the tension level for an easier or more difficult workout. 6 Preset workout programs with time, distance, RPM, Watts, Calories Burned and Heart Rate readouts. The computer has a built-in iPad holder which also can be used for other mobile devices as well as books or documents for reading. Hand Pulse Monitor to stay within your Target Heart Rate Zone. A large contoured backrest is provided for comfortable back support.